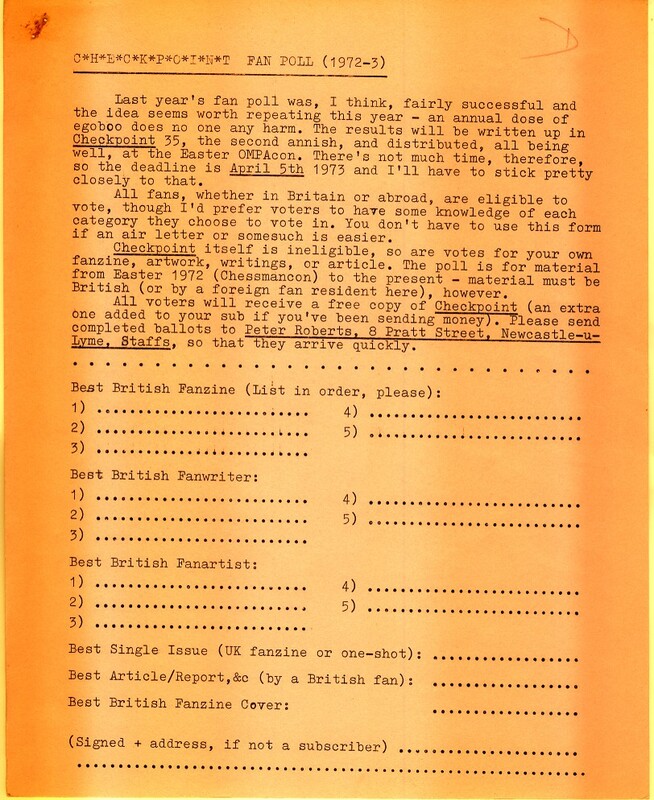 This highly informal poll of British fanzine activities began in Checkpoint under Peter Roberts's editorship in 1972. It appeared as a separate Roberts-produced supplement in the years -- entries marked * below -- when Checkpoint itself was edited by other hands. When Checkpoint ceased in 1979 and was succeeded by Ansible, Dave Langford (who had conducted and published the results of a parody poll earlier in 1979 -- see "1978-9 spoof" below) continued to run the poll for some years as the Checkpoint/Ansible Fan Poll. Categories remained the same, with the addition of "Worst Thing" from the 1980-1981 poll onward. Some discussion of this poll appeared in Ansible 25. It was skipped owing to general voter apathy in 1984, as perhaps foreshadowed by editorial Angst in Ansible 39 and recorded in Ansible 40. The poll finally died in 1985: see Ansible 43. Thanks to Rob Hansen for providing the 1972-1973 ballot image -- blank ballots from the Peter Roberts era are not easy to find.